December retail sales were a bit weaker than expected (up 0.6% vs. 0.8%), but they were still up by a significant amount. 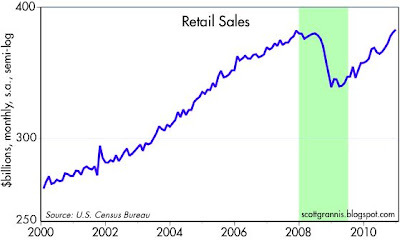 And as the chart above shows, retail sales have now fully recovered from the 2008-2009 recession, rising 7.9% in 2010. In the second half of last year, sales rose at a very impressive 11.2% annualized rate. This is indeed a recovery in every sense of the word. But this recovery is a testament not to the indomitable U.S. consumer, but to the nature of this past recession. Much of the decline in the economy was the result of fear, which in turn caused people to hoard money instead of spending it. As fears have dissipated and confidence has slowly returned, money has been de-hoarded, driving up sales. This and other "forces of recovery" will continue to act in a virtuous cycle fashion, reinforcing themselves and continuing to drive the level of economic activity higher in the years to come. What do you think of some of the arguments that "this rally is tired" or "the market has moved up too fast."? Shouldn't it matter more whether the economy is growing and if stocks are reasonably priced to their earnings? this is a poor post in many ways, and i am sure you as a bona fide economist know why. Bill: technicians could answer your question better than I. I don't even try to pick short term ups and downs--I'm in for the long haul. Nevertheless I don't see any signs yet that the market has gone too far in the direction of optimism.